Larsen steel piles foundation pit, and some excavation with a digging machine, and then artificial excavation. Specifically, what kind of excavation Method is used to meet according to the place of the project, for example, on the ground, or beside the river. Today we come to introduce the use of artificial excavation Larsen steel piles of the pit of the attention of what? The use of artificial excavation Larsen plate pile foundation pit, before digging according to engineering, pre-construction program, to understand the clear underground pipeline, air defense and other building conditions and specific location. If the excavation process in the presence of tombs, underground pipes, cables or other unrecognizable foreign body and liquid, gas should immediately stop excavation operations should be reported to the person in charge, to be identified after processing, and then continue to dig. During the construction of the foundation pit slope, to prevent surface water (including rain, construction water and domestic wastewater) into the construction site, scouring the foundation pit slope; under heavy rain should be suspended earth construction. Excavation earth should be from top to bottom layer by layer, the two should be greater than 2 meters spacing. It is forbidden to use digging method. When excavating the pit depth of more than 1.5m, should be set up or down dedicated slope or ladder; excavation depth of more than 2m, must be in accordance with the provisions of the foundation pit edge of the protective railings; deep excavation should be Someone to carry out monitoring. Foundation excavation operations should always pay attention to soil wall changes, found signs of cracks or slump, to be accepted processing. When the earth is to be built at night, there should be enough lighting. The excavation operations should be effective for all types of underground pipeline protection, to prevent the pipeline was broken damage caused by leakage, leakage, leakage, etc., threatening the safety and health of workers. Excavation of the pit near the road, should be set to red lights, night warning. 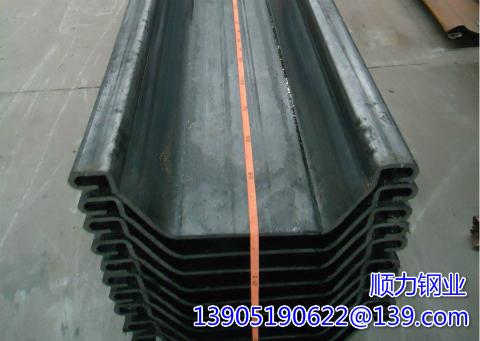 Larsen steel piles after the pit is dug, you should check the daily steel wall and support the stability of the wall, do not pile the soil and other objects on the support, but not Larsen steel sheet support walking or standing.